Irrigation technology is becoming more efficient. Our post lists trends and tips you can use to irrigation more efficiently. Controlling your system on any device anywhere. All you need is an app. Access using your cell service or WiFi. Revise schedules; start and stop. 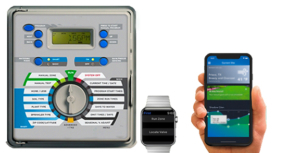 User will receive real time notifications, saving precious time and water for homeowners and Property Managers. To fully utilize their water saving capability a ton of data needs to be entered correctly. For example: soil type, slope information, sun or shade, plant types and type of irrigation. Weather data is accessed via the web or local weather stations. Historical weather data can help with a watering schedule and it can serve as a back up if there is an interruption in service. 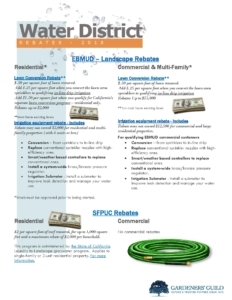 See our previous blog for rebate information. Depending on the district, there might still be rebates for purchasing smart irrigation controllers. It just means grouping your plants by their water needs. Your drought tolerant plants are mixed in with water loving plants neither will be happy. You will either have crispy leaves or root rot. Example: seasonal color beds have different water needs from turf areas. They should have separate valves. Their water needs may change as they grow. Adjust as needed. An example: too much pressure will cause runoff and waste water. Older sprinkler nozzles may need replacing. See below on trends and tools for irrigation. It is designed to irrigate with a high volume of water using spray heads. It is best for large turf areas that are wide and flat. They waste water due to evaporation and runoff. Because water is applied to foliage – there is potential of plant disease. Winds will reduce its efficiency of application. They are only 50-70 percent effective. High efficiency nozzles can reduce water use. We recommend them when appropriate. “They require longer irrigation run times. “Make sure you are aware of your plant water needs”, says Paul Swanson, thirty-year veteran of GGI and the company’s Director of Business Development. For plants other than turf, drip is most efficient. Over 90 percent. Water is released slowly and directly into the soil from its emitters. The water goes directly to the base of the plant. It costs less to install, than a sprinkler system. Water is applied slowly. Particularly good for slopes. It minimizes the chance of runoff. Lower water use; less waste. Less contact with foliage. Less chance of disease. Because the tubing is below ground, repairs are more complicated. It requires regular maintenance to ensure plant health. This is the only way to confirm that the system is releasing sufficient water. Tubing can become blocked so periodic flushing is a necessary part of maintenance. Not only does California have to plan for potential droughts, but the reality is that water prices will continue to rise. A study contracted by the Institute for Public Utilities states that water and sewer rates are growing by an average of 7 percent a year. This exceeds income growth. The reason – customer revenues are no longer sufficient for utilities to recoup rising operating costs.